cricket | Next goal wins laaaaaaads! What a thoroughly nice bloke! Well it is that time again. Another ritual humiliation is on the cards. So I thought with the Third Ashes Test match due to start this Thursday that I would revive the “Caption Competition”. Reblogging the original post gives me the chance to sing the praises of Philip Brown. 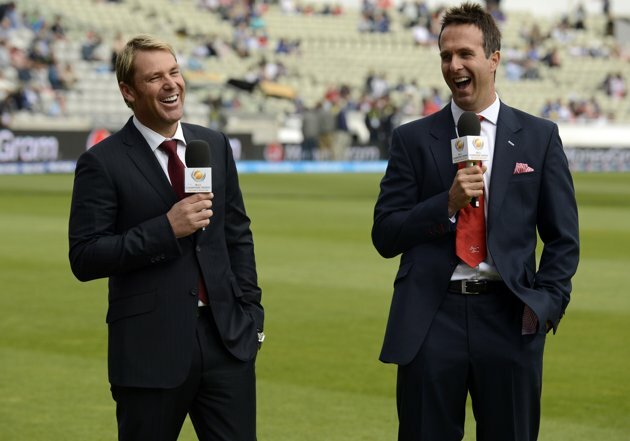 He is the photographer who captured that moment perfectly when Shane Warne and Michael Vaughan share a private joke. Now I am guilty of using a search engine to find a photo that I want for this blog and simply copying it and using it without paying much attention to who who took it. However in this instance I chanced upon this image first whilst casually surfing the net, reading cricket stories and then only after seeing the photo did I write the blog. Writing about the image retrospectively made me think a bit more about how it was captured and as a result I traced Philip Brown to his website (Philip Brown – photographer) and saw some of his work. I also wrote an email to him asking permission for me to use his photo and to my great surprise he wrote back and granted it and he seems like a top bloke too. Great photo from REUTERS/Philip Brown of two blokes who could play a bit in their time, but now just enjoying the day at Edgbaston yesterday. But what were they saying? My guess is that Warne was saying to Vaughan.